which he brought home one day. which he named Nanny Bell. he taught that goat some tricks. "Cut up Nanny Bell, cut up,"
stamp her feet, and shake her head. that goat would not give up. "Go home goat, go home." would make him late for school. by eating up his feed. 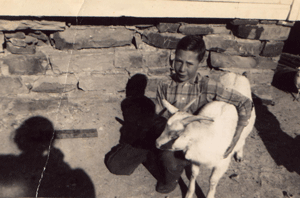 his little goat named Nanny Bell. to do her little chores. this bright idea he had. and they went off in his hand. turned out to be quite bad. as through that barn she'd go. each time that goat ran through. and get her off his land. and eating up his feed. that kind of dough before. but our Landlord paid five bucks.